WAND Taxonomies Blog: How do I create a managed metadata column in SharePoint? How do I create a managed metadata column in SharePoint? SharePoint Managed Metadata Question of the Week Each week we will be featuring an audience question from WAND's recent webinar, "Managed Metadata 101: Taxonomies and Tagging in SharePoint," and sharing the answer with our blog audience. This week's question is: "How do I create a managed metadata column in SharePoint?" Answer: Managed metadata columns are where taxonomy terms from the SharePoint term store get populated. Last week, we looked at how the enterprise keyword column is used in SharePoint. The Enterprise Keywords column is the default managed metadata column, but for many people, it may be necessary or desirable to create a custom column for taxonomies. To do this, you need to create a new managed metadata column. Metadata columns can be created and associated to either sites or lists and can be further referenced by a content type. 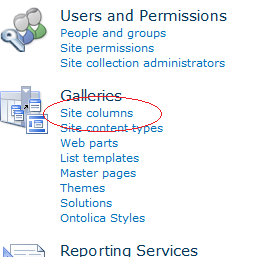 To create a new site column, you need to go to "Site Settings" and then "Site Columns" which is under the Galleries section. You then click "Create" and you'll be presented with the new column creation screen. Under "type" you will select Managed Metadata radio button. This column is now connected to the term store and you will have the opportunity to associate it with any specific term set in the term store. Only terms from the specific term set you select will be valid values in this column, thus a custom managed metadata column is more specific than the Enterprise Keywords column. Again, the Enterprise Keywords column can be populated with any terms from the term store. In the example in the image above, the managed metadata column has been created and only terms from the WAND General Business Taxonomy will be valid values for this column. To create a custom managed metadata column at the library or list level, you simply choose "Create Column" in the ribbon bar at the top under "Library tools" or "List tools" respectively.